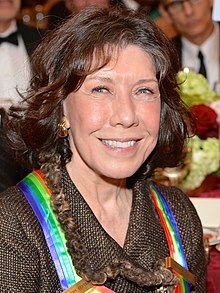 Mary Jean "Lily" Tomlin (born September 1, 1939) is an American actress, comedian, writer, singer, and producer. Tomlin began her career as a stand-up comic as well as performing Off-Broadway during the 1960s. Her breakout role was on the variety show Rowan & Martin's Laugh-In from 1969 until 1973. She currently stars on the Netflix series Grace and Frankie as Frankie Bergstein; the role has garnered her four consecutive Emmy nominations since 2015. In 1974, Tomlin was cast by Robert Altman in her first film; her performance as Linnea Reese in Nashville won her several awards and nominations for the Golden Globe and Academy Award for Best Supporting Actress. 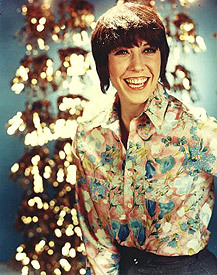 Mary Jean "Lily" Tomlin (born September 1, 1939) is an American actress, comedian, writer, singer, and producer. 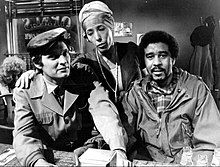 Tomlin began her career as a stand-up comic as well as performing Off-Broadway during the 1960s. Her breakout role was on the variety show Rowan & Martin's Laugh-In from 1969 until 1973. She currently stars on the Netflix series Grace and Frankie as Frankie Bergstein; the role has garnered her four consecutive Emmy nominations since 2015. In 1970, AT&T offered Tomlin $500,000 to play her character Ernestine in a commercial, but she declined, saying it would compromise her artistic integrity. In 1976, she appeared on Saturday Night Live as Ernestine in a Ma Bell advertisement parody in which she proclaimed, "We don't care, we don't have to...we're the phone company." The character later made a guest appearance at The Superhighway Summit at UCLA on January 11, 1994, interrupting a speech being given on the information superhighway by then-Vice President Al Gore. She appeared as three of her minor characters in a 1998 ad campaign for Fidelity Investments that did not include Ernestine and Edith Ann. In 2003, she made two commercials as an "updated" Ernestine for WebEx. In 1972, Tomlin released This Is A Recording, her first comedy album on Polydor Records in 1972 that contained Ernestine's run-ins with customers over the phone. The album hit #15 on the Billboard Hot 200, becoming (and remaining as of 2011[update]) the highest-charting album ever by a solo comedienne. She earned a Grammy award that year for Best Comedy Recording. ↑ "Lillie M Tomlin - United States Social Security Death Index". FamilySearch. Retrieved 24 August 2015. ↑ "LilyTomlin>Biography". FilmReference.com. Retrieved March 6, 2009. ↑ "Mary Jean Tomlin - United States Census, 1940". FamilySearch. Retrieved 24 August 2015. ↑ Fischbach, Bob (October 1, 2008). "Stage holds the magic for Tomlin". Omaha World-Herald. Retrieved July 29, 2008. ↑ Kelly, Kevin (August 11, 1985). "Lily Tomlin Mysterious Modest and Multifaceted". The Boston Globe. Retrieved July 29, 2008. ↑ Kelli Bender, "Lily Tomlin Reprises Ernestine Role for PETA's New Ad Blasting SeaWorld," People, 14 April 2016. ↑ Chambliss, John (January 7, 2010). "Lily Tomlin, Playing Lakeland Next Week, Dishes on Her Act, Sexuality and Retiring". The Ledger. Lakeland, FL. Retrieved October 16, 2012. 1 2 Elliott, Stuart (September 4, 1998). "Lily Tomlin in Madison Ave. debut with Peter Lynch". New York Times. Retrieved October 16, 2012. ↑ Rutenberg, Jim (January 15, 2003). "WebEx to Begin $8 Million Campaign". New York Times. Retrieved October 16, 2012. 1 2 "Chart beat: Katy Perry, Kathy Griffin, Miley Cyrus". Billboard.com. ↑ Christgau, Robert (1981). "Consumer Guide '70s: T". Christgau's Record Guide: Rock Albums of the Seventies. Ticknor & Fields. ISBN 089919026X. Retrieved March 16, 2019 – via robertchristgau.com. ↑ Houston, Frank (April 12, 2007). "What a Character. She's had her brush with online infamy. Now Lily Tomlin is ready to make you laugh again". ↑ Rose, Charlie (August 16, 2015). "Grandma: A look at the film "Grandma" with director Paul Weitz and actor Lily Tomlin". Charlie Rose. Archived from the original on August 22, 2015. Retrieved August 23, 2015. ↑ Scott, A. O. (19 August 2015). "Review: In 'Grandma,' Lily Tomlin Energizes an Intergenerational Road Trip". The New York Times. Retrieved 23 August 2015. ↑ Murphy, Mekado (19 August 2015). "'Grandma' (With Movie Trailer): Paul Weitz Narrates a Scene". The New York Times. Retrieved 23 August 2015. ↑ "Exclusive News on Ponyo's English Voice Talent Cast". Ghibli World. November 26, 2008. Archived from the original on December 6, 2008. Retrieved November 30, 2008. ↑ The Associated Press (21 August 2015). "Lily Tomlin Isn't Buying Her Own Hype". The New York Times. Retrieved 23 August 2015. 1 2 Tomlin, in Shulman, Randy (April 27, 2006). 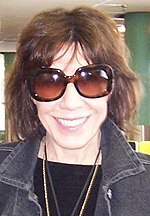 "Lily Tomlin". Metro Weekly. Washington, D.C. Retrieved January 7, 2014. ↑ Tomlin in Radosta, Jim (May 30, 2008). "Lily Tomlin Interview". Just Out. Not online. Quote referenced in sources including Kaye, Frank (February 16, 2012). "Lily Tomlin Graces the Stage". Baltimore Gay Life. Gay, Lesbian, Bisexual, and Transgender Community Center of Baltimore and Central Maryland. Retrieved January 7, 2014. ↑ Smith, Liz (January 3, 2014). "Was life a 'Cabaret' for Bob Fosse? Yes, no, maybe". Tribune Content Agency. Archived from the original on January 7, 2014. Retrieved January 7, 2014. ↑ Silverman, Stephen M. (January 7, 2014). "Lily Tomlin Marries Jane Wagner After 42 Years Together". People. Retrieved January 7, 2014. ↑ Takeda, Allison. "Lily Tomlin Marries Girlfriend Jane Wagner After 42 Years Together: "They Are Very Happy," Rep Says". ↑ "Fall Season 2013: Episode 6 | In the Mixx". Inthemixxshow.com. 2013-10-17. Retrieved 2014-06-29. ↑ "The Envelope: Entertainment Awards Database" search for Lily Tomlin. Los Angeles Times. Retrieved September 25, 2011. ↑ "Lily Tomlin Awards & Nominations". IMDB.com. 1 2 3 4 "Lily Tomlin Awards & Nominations". IBDB. 1 2 "Grammy Past Winners Search" for Comedy Album This is a Recording. Grammy.com. Retrieved September 25, 2011. ↑ "Past Recipients" Archived June 30, 2011, at the Wayback Machine. WIF.org. ↑ "Women's Dinner Party 2009" (Press release). Fenway Health. March 5, 2009. Retrieved May 24, 2010. ↑ Brassart, Scott; Maytag, PJ (February 24, 2012). "Honoring Lily and Jane: A lifetime of love and companionship". The BottomLine Magazine. San Diego Gay and Lesbian News. Archived from the original on April 13, 2012. Retrieved October 28, 2012. ↑ "Award Search". Official Emmy Awards site (search for Lily Tomlin). 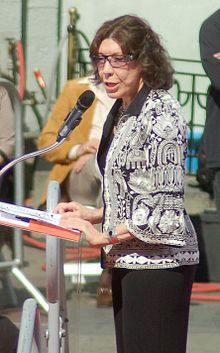 Wikimedia Commons has media related to Lily Tomlin.